Pictures & images of the Saxon & Székely fortified church of Transylvania, Romania. The Saxon villages of Transylvania appeared in the thirteenth century when the Kings of Hungary settled German colonists in the area. They had a special status among nations in the province and their civilisation managed to survive and thrive, forming a very strong community of farmers, artisans and merchants. Being situated in a region constantly under the threat of the Ottoman and Tatar invasions, they built fortifications of different sizes. The most important towns were fully fortified, and the smaller communities created fortifications centered around fortified churches, where they added defensive towers and storehouses to the inside of the church walls to keep their most valuable goods and to help them withstand long sieges. The inside of the walls of the biggest Saxon fortified churches have rows of rooms 3 storeys high where a families grain & meat would be stored so during times of attack the inhabitants of the town simply barricaded themselves into the fort living in their rooms full of their provisions. Up to 2000 people could flee to safety in the huge church fortifications of Prejmer, Transylvania. Over 150 fortified churches survive in Transylvania of which a group of six Saxon and one Székely villages is listed as a UNESCO World Heritage Sites. 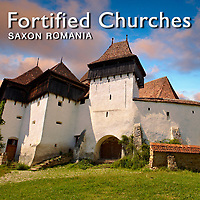 Download photos of Saxon fortified churches in Romania or buy photo art images of Saxon Fortified churches on line.